Growing Up Geeky: September Sponsor Love! Meet Jessica from the Chaos & Love Etsy shop! I am a working mama of two boys – Joey (almost 3) and Luke (8 months). My husband is a chef so the boys and I spend a lot of time at home on our own which gives me tons of time to be crafty. My love affair with all things handmade started when I was young. I was surrounded by crafty people all my life and I always loved creating things to give as gifts or to decorate my life. It wasn’t until recently that I realized not everyone has the skill or inclination to be crafty and with that realization a dream was born. I opened Chaos & Love on Etsy about 4 months ago. My first items (and most popular) were crocheted hats. I try only to use patterns from other Etsy vendors because I believe so much in the community that exists there. Most hats are made to order and can be completely customized. I am adding new styles all the time and am especially excited about the fall designs. 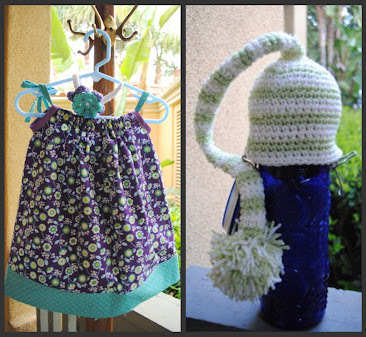 In addition to the crocheted items listed in the shop, there are a few hand sewn items. I have made-to-order pillowcase dresses and our newest item, denim and flannel rag quilts! I am so excited to add these quilts because they are one of my absolute favorite things to make and I think they make fabulous keepsakes. Jessica is offering a 10% off coupon code to my readers! Just enter GEEKYFALL10 at checkout. You can see more of her adorable pieces on Carina in my review post from a couple months back. Please check out Chaos & Love on Etsy!